QUEBEC CITY, QC – November 15, 2016 – LeddarTech, the leader in solid-state LiDAR solutions, today announced that its LeddarOne optical sensor has been selected by Robota as the altimeter for the Eclipse, its new generation of fixed-wing UAV for professional surveying applications. 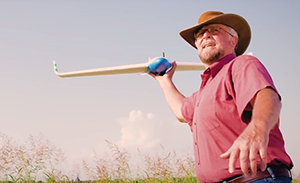 LeddarOne proved to be the best technology available to provide the drone’s autopilot with the precise, real-time height-above-ground-level measurements required during the sensitive landing phase. Benchmarked with other ranging technologies as part of a thorough evaluation process, LeddarOne proved superior to ultrasonic sensors, with its superior range and environmental durability, and outperformed optical flow sensors, which couldn’t compete with the accuracy and speed of the LeddarOne. The LeddarOne also outperformed competing LiDAR solutions to which it was compared. “Finding a small sensor with sufficient range and precision that would work in a variety of outdoor conditions turned out to be very challenging,” stated Antonio Liska, Robota’s president. “When selecting an altimeter for the Eclipse, we considered many criteria including size, power consumption, detection range, refresh rate and reliable detection on targets in various conditions, including snow,” added Mr. Liska. Robota’s engineers concluded that the LeddarOne’s use of a diffuse infra-red LED source (instead of a narrow-beam collimated laser) delivered superior performance. The sensor’s wide light beam, coupled with its proprietary digital signal accumulation and oversampling, helps smoothen the terrain measurements and provides consistent readings, especially in cases of flying over brush, bushes or tall grass. In comparison, other LiDARs using collimated laser beams tended to return variations in altitude, which may be unwanted and can mislead the auto-pilot. The LeddarOne also demonstrated the required measurement rates and efficient data transmission, which are paramount when landing a drone that is descending at 5m/s. Introduced in 2016, the custom-made Eclipse UAV is an advanced mapping system that can cover nearly 400 acres per 50-minute flight and capture high resolution images with on-board cameras. Its applications include agriculture, construction, mining, and urban analysis. LeddarOne is a very compact, high performance optical sensor module that is entirely dedicated to a single point measurement. This fixed-beam LiDAR solution can be used in various types of drones, including multi-rotors, for altimetry applications. Other models of Leddar sensors, such as the multi-segment LeddarVu, caters to other drone navigation applications, including collision avoidance. Robota develops autopilots and drones in the U.S.A for use in commercial applications. The company was founded in 2011 and began development on the Goose autopilot, which is featured in the Eclipse flying wing mapping drone. Robota’s goal is to help organizations improve their data collection and solve complex problems with UAV systems.